auder Akustik Vescova MkII is a new version of the loudspeaker that we were able to look at "High Fidelity" in April 2008 (No. 48, read HERE). 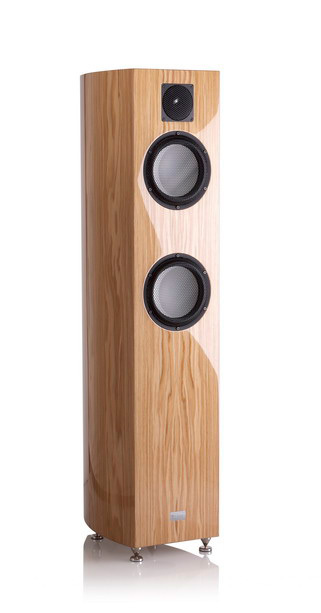 These speakers belong to the Ceramic series, that includes also the larger three-way Cassiano MkII and the stand-mounted FRC MkII. The Ceramic is the middle series in this German manufacturer's range. As usually in such a case it has the best value for the money - it's not as expensive as the top Berlin series, but it's expensive enough to fit in some solution borrowed from the flagship line, which makes it significantly different from the less expensive series, Arcona. At first glance, the second version of Vescova looks similar to MkI. These are 2,5-way floorstanding loudspeakers measuring 1060 x 210 x 410 mm (H x W x D) and weighing 26 kg (pc). 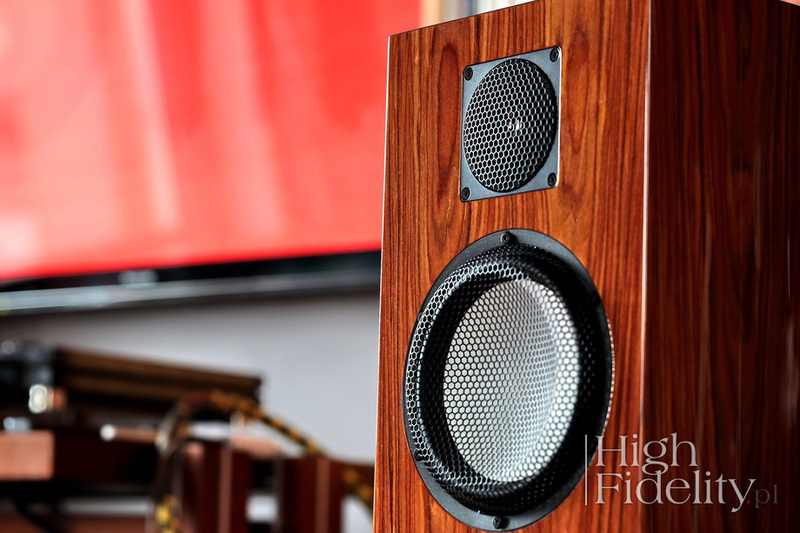 They feature two identical 180mm Acuton ceramic drivers, with one of the filtered from the top at 130 Hz and working in a down-firing bass reflex cabinet. The second of the ceramic Acutons is located just below the dome tweeter and is not filtered from below. It works in a closed enclosure. The loudspeakers feature a lute-like shape and their cabinets are made of bent plywood. 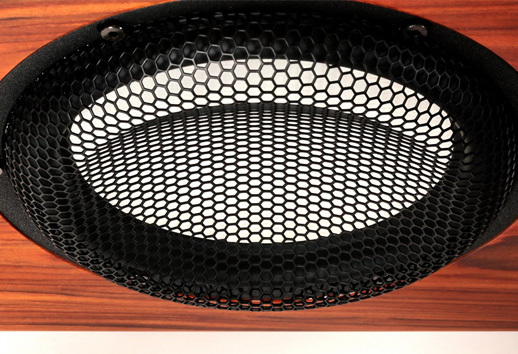 Vescova MkII, like other Gauder Akustik speakers, are made in Germany. There are, however, differences between the old and new version. First, of course, is the new name of the company. The Isophon brand under which they were once sold was founded in 1929. Between 1997 and 2012 the company was called Isophon Acoustic Consulting GbR, and Mr. Roland Gauder was responsible for the designs. In 2013 he founded a company bearing his name, Gauder Akustik, and he took with him all the designs he created in Isophone, adding some new models to them. The next difference is the crossover point between the woofers – previously it was at 180 Hz, now is at 130 Hz, also moving the speaker terminals from the bottom to the rear, and some other upgrades. An important change compared to the MkI is the option of using not only the Acuton's ceramic dome, but also a diamond dome, and we are testing the latter version. The price increases by almost 25,000 PLN, but the qualitative difference between these drivers is simply huge. One can also choose one of the available finishes. For this test distributor delivered a very nice, most expensive version, with high gloss lacquer. The loudspeakers were brought by - as always reliable – guys representing RCM, the Polish distributor of the Gauder Akustik. During transport, they are packed in large boxes, so despite the fact that each of them weighs no more than 26 kg, when packaged, they weight much more. Along with the speakers they brought granite basis shaped after cabinets, which in the price list are called Flagstone and cost 2590 PLN (per pair). The speakers were place in exactly the same spots that my own Harbeth M40.1 usually occupy. Unlike usually, they were placed facing straight ahead, without any toe-in. 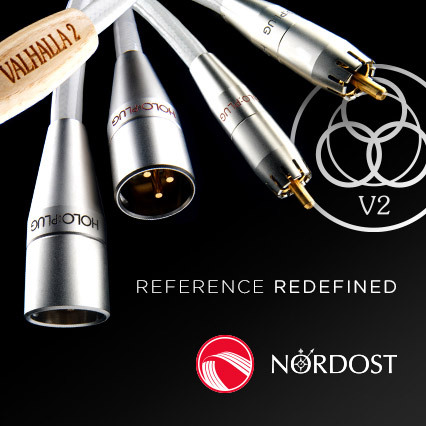 As Wojtek (who you might know as an author of the TURNTABLE CALIBRATION – course for beginners, POLISH), said in the distributor's listening room, this setting gave the biggest and simply the best sound stage. Because in my room almost always speakers sound better when toed-in I tried both variants. This is the first time I decided that positioning without toe-in sounded better. When setting up Gauders, one should also pay attention to the height of one's ears relative to the midrange/tweeter section (ie how high you sit). With the Vescova MkII one has to sit so that the ears are exactly between two upper drivers (tweeter and low- midrange). If one sits lower, the sound will be slightly nasal, with a slight emphasis on a part of midrange. When one sits down on the right height everything shall fall into place. I could not help but to write about it in the beginning: the sound we get with the Vescova MkII speakers is in many ways similar to the earliest open baffle loudspeaker designs with horn tweeters. Playing record after record I felt as though the eight decades that had passed were only a short interlude, and only now we are "re-discovering" a similar type of presentation. But it is not the same sound, that's not the point - in some respects, Gauders are at the opposite end of the spectrum from products from the 1930s and 40s. Speaking of open baffles and horns I meant a general idea for sound presentation. If I understand it correctly, it is supposed to be an absolutely coherent presentation, both internally, between small elements and externally, ie with interrelated big assumptions. The point is that these speakers sound like a single transducer set in a large room and working with this room closely. What's more, when it comes to tonality they sound in an absolutely aligned way. And there is also this great holography – the Vescova MkII should be able to easily convince any fan of small monitors that large speakers can provide very good imaging too. It all happens at the same time, everything is intertwined and even if I am forced to distinguish the different aspects of this play, it is an artificial division. The tonality of the tested loudspeakers is – forgive me for that - warm. It's not artificially warmed up, it is about how resolving it is which might be interpreted as a warm sound.